Cambridge Sound Management Inc., manufacturer of sound masking and speech privacy solutions, has acquired Dynasound Inc., a commercial sound masking manufacturer based in Norcross, GA.
To prepare for the next stage of growth, Cambridge Sound Management will integrate Dynasound's products, dedicated partners, and industry experts into Cambridge's proven sound masking business model. 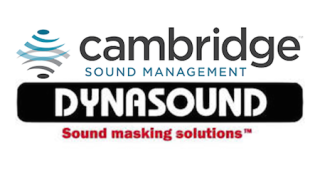 "Dynasound has compelling speech protection technology, a loyal customer base, and a great team with a rich history of innovation and service in our category," said Christopher Calisi, CEO of Cambridge Sound Management. "With global demand for sound masking on the rise, we will be well positioned to further expand customer and channel support services and launch a new generation of solutions." "We are excited about joining Cambridge Sound Management and being part of an organization so closely aligned with our goals of achieving the highest level of quality, service, and solutions for our partners worldwide," said Tom Koenig, CEO of Dynasound. As more companies shift to open floor plans, the need for speech privacy and the reduction of noise distractions in the workplace is increasing. Additionally, with many organizations adding employees to a workspace without increasing the square footage, new productivity, privacy, and security problems are emerging. Sound masking solutions from Cambridge Sound Management and Dynasound have emerged as effective, virtually invisible technology to increase speech privacy and comfort, while enabling companies to maintain their open and collaborative work environments. The companies will combine operations immediately under the Cambridge Sound Management brand.